Select seasonal fruits of choice, such as those listed. Choose any fruit combination or single fruit to equal 1/2 cup serving. If serving other fruits, reference the Food Buying Guide to determine the serving size required to meet the fruit component. The day of service; rinse fruit under cold running water then drain. Peel, if needed, and cut into bite-sized portions. Toss all together to make a blend of fruits. Reserve for Step 4. Line 9" x 5" salad tray with 2 leaves of green leaf lettuce. In center of tray, portion 1/2 cup fresh fruit mix (grapes, cantaloupe bites and honeydew bites). Place one 4-ounce cup of yogurt in front corner. Place one 2-ounce individually wrapped muffin in opposite corner of yogurt. Add 1 ounce of American cheese cut into strips. Add sliced kiwifruit and strawberries for garnish. Cover and refrigerate until ready for service. Serve 1 salad for each portion. Each portion provides 2 oz. eq. meat/meat alternate, 1 oz. eq. of whole grain, 1/2 cup fruit, and 1/8 cup dark green vegetable. 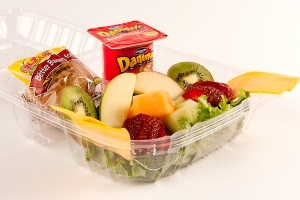 Fruit may be served whole or sliced, depending on student's preferences. If other fruit is served, refer to the USDA FNS Food Buying Guide for Child Nutrition Programs to determine the serving size required to meet the daily fruit component requirement. If other types of fruit are offered, the nutrient analysis must be recalculated. Presentation Ideas: Line plates with lettuce leaves prior to arranging fruit. A container allowing space for the salad, yogurt and muffin is recommended. Clear plastic lid for eye appeal is preferable. A container allowing space for the salad, yogurt, muffin, and cheese is recommended. Clear plastic lid for eye appeal is preferable. Crediting is based on fruit listed in the ingredients. Crediting is based on fruit listed iningredients. If serving other fruits, reference the Food Buying Guide for Child Nutrition Programs to determine the serving size required to meet the fruit component. 1 serving of Fruit and Yogurt Plate.